The Latest Mozilla Firefox Browser. Discussion in 'Computer and Internet' started by Philip Nulty, Oct 1, 2011. 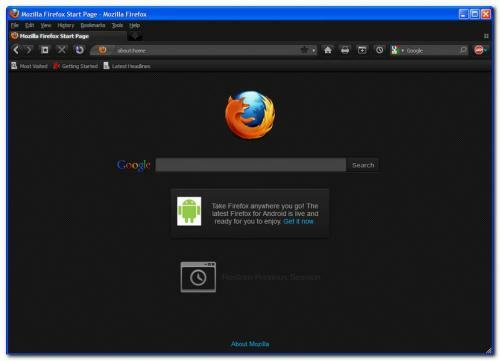 Well it certainly seems faster,..but that's just my opinion on the latest Mozilla Firefox Browser 7.0.1. While i downloaded the new version i thought to treat myself to a new home page,..perhaps because summer is over i decided on black,..not everyone's cup of tea. I once made a black background web site. While O.K. after awhile it was a pain changing text that errantly appeared in black. It does make for a change. I will have to give the new firefox a whirl. Thanks for the heads up. I have the new Firefox too. The only thing that bothers me is that my Gardenstew toolbar is gone! i can well imagine a website with a black background and the problem with text,..there is a Music website with a black background,..it can be a headache at times,"Songbird",..it used to be jet black,..now faded to a lighter colour. About the new Mozilla Firefox Browser 7.0.1. The only thing to watch are your present Add Ons,..will they be compatible?,..all mine were luckily,..but it wouldn't have bothered me if they were not,..only the hassle of seeking replacements. Those three i could not do without,..the latter means i NEVER see an advertisement on any website. On another web site i visit some members couldn't find the means to get rid of an unwanted Toolbar,..or an unwanted Home Page,..so perhaps the method has changed from the old Firefox,..but in the new version its. sorry i didn't spot your post,..it came through as i was posting to Jerry,..i never had a GardenStew Toolbar ,..i never knew there was one available, ,..up to now i have just bookmarked GardenStew,..however i admit not having ANY Toolbar other that the Firefox,..just a habit of mine,..but i might make an exception for GardenStew,..must look into this, . For those of you that have issues with your Add-on compatibility try the following Add-on. thanks for that link,..very handy!,..i wasn't aware of it before. I gave up on Firefox. Loads of pages would just sit there and not load. I know other people with the same problem too so it can't be my computer. Using Chrome now and haven't looked back. Anytime anyone has trouble with pages loading or if Firefox just seems slow just enter Firefox into Safe Mode. Do not confuse Firefox Safe Mode with Windows Safe Mode... not the same. I used to use firefox and gave up on it, then went to google chrome which was great but when the extension part came with it, I soon got it removed from my laptop and now I just use edge which you can also open with windows internet explorer. Hello May...this is the lastest version of Firefox I don't know if it will help you.